The giant supersonic parachute on NASA's Low-Density Supersonic Decelerator only partially deployed during a June 8, 2015 launch test. The parachute was 100 feet wide, the largest supersonic parachute ever to be tested, NASA says. Today's test, which lifted off from the Pacific Missile Range Facility on the Hawaiian island of Kauai at 1:45 p.m. EDT (1745 GMT; 7:45 a.m. local time in Hawaii), was similar to the first LDSD flight. That June 2014 test also went well until it was time for the supersonic chute to catch the fast-moving air. The 1-ton Curiosity rover is the heaviest object NASA has ever put down on the Red Planet. Curiosity landed in August 2012, pretty much maxing out the capabilities of its rocket-powered "sky crane" and 50-foot-wide (15 m) parachute. "Right now, we are kind of at the technological limit of what we can land on Mars in terms of size and weight," Steve Jurczyk, associate administrator of NASA's Space Technology Mission Directorate, said during a prelaunch news conference on June 1. NASA's "flying saucer" - called the Low-Density Supersonic Decelerator - launches on its second test flight on June 8, 2015 to test an inflatable decelerator and giant supersonic parachute in this view from an onboard camera. The parachute did not inflate properly during the test. "So this new technology is required to land 5 metric tons for human missions, maybe 30 [metric tons] and beyond," he added, referring to the LDSD system. The LDSD team has devised a high-altitude test for this gear, taking advantage of the fact that the thin air far above Earth's surface is a good analogue of the Martian atmosphere. A 400-foot-wide (121 m) balloon lofts the LDSD test vehicle up to an altitude of about 23 miles (37 kilometers) from the Pacific Missile Range Facility. The 7,000-lb. (3,175 kilograms) craft is dropped; it then fires up its onboard rocket engine, which blasts the vehicle to supersonic speeds and a height of 34 miles (55 km) or so. Then, the SIAD inflates. This maneuver slows the LDSD craft down from about four times the speed of sound (Mach 4) to Mach 2.35 — slow enough, theoretically, for the huge parachute to deploy safely and guide the vehicle down to a soft splashdown in the Pacific Ocean. The LDSD system's first such flight test was on June 28, 2014. Everything went well that day until it was time for parachute deployment; the supersonic chute was quickly destroyed. Nevertheless, LDSD team members declared the trial a success, saying they had learned a great deal that would help them improve the landing technology. Indeed, today's flight featured a new and improved supersonic chute, said LDSD project manager Mark Adler, of NASA's Jet Propulsion Laboratory (JPL) in Pasadena, California. "Now, we've developed a much more robust, stronger parachute they're going to be able to test this time," Adler said during the June 1 news conference. This second test centered primarily on the new chute, since the SIAD and other aspects of the test vehicle worked well the first time around, mission team members said. So the groans that that could be heard in mission control after today's apparent parachute failure made a great deal of sense. Once again, everything worked well — the test vehicle separated as planned at 5:35 p.m. EDT (2135 GMT); the rocket engine fired, accelerating the craft up to Mach 4 — except the revamped chute. This four-camera view from NASA's "flying saucer," the Low-Density Supersonic Decelerator, shows different views from the craft during its June 8 launch to test Mars landing technology. 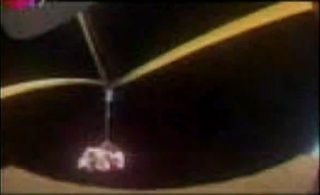 The craft's inflatable air brake inflated, but its parachute (lower left) failed to deploy properly. Though the parachute didn't work as hoped, today's test will still return valuable information, mission team members said. "This is exactly why we do tests like this before we send things to Mars, so that we can understand exactly how they work, or don't work," said JPL engineer Dan Coatta. "Then we can improve on our designs to make sure that, when we're actually ready to send [heavy] spacecraft to Mars, we know that they're going to work when that big mission is on the line," Coatta said during the webcast of today's test, which aired on NASA TV. The cost of the LDSD program is about $230 million, Adler said. A third test flight, also planned to launch from Kauai, is tentatively scheduled for next year. Today's test flight was originally scheduled for June 2, but strong winds and rough seas that could have hampered recovery of the LDSD vehicle delayed the liftoff by nearly a week. Editor's Note: This story is an updated version of our earlier launch story and includes new details about today's LDSD test flight.